I should clarify. I’m a terrible housekeeper, but I’m messy not dirty. I keep my bathroom and kitchen clean. I do the dishes and take out the garbage regularly. Except before I left for Michigan this passed weekend. I completely forgot to take the garbage down to my can in the garage. This probably wouldn’t have been a problem except that I had thrown out a bunch of produce that wasn’t going to last through the weekend away. Enter my problem: fruit flies. Lots of them. Torturing me day and night…or well, at least when I’m in the kitchen. Anyone know how to effectively get rid of fruit flies? Moving right along. Dinner tonight was classic comfort food, and I hit all five food groups. 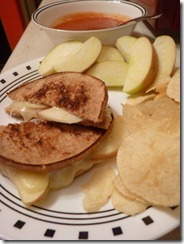 Dairy, whole grains, fruits, veggies, and potato chips. 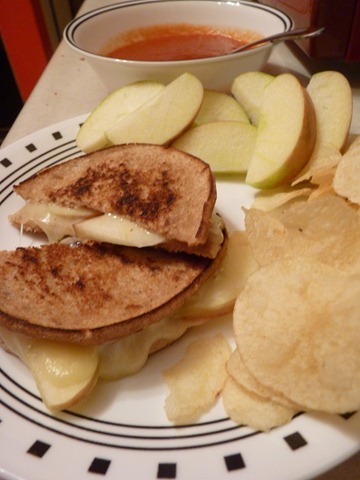 Grilled cheese on a whole wheat Arnolds sandwich thin with Monterey cheese and apple slices. The rest of the apple. Amy’s Cream of Tomato soup. And Jay’s (read: my absolute favorite) potato chips. For the record, the Amy’s soup is fantastic! I’m not a huge tomato person…actually, i hate them. I’m trying to learn to like them more so I figured soup might be a good place to start.